At the Hill, Curley Haugland and Sean Parnell explain both the history and the law. As the Republican National Convention prepares to kick off next week in Cleveland, there is a lot of confusion and controversy over the question of whether delegates to the convention are “bound” to vote for any particular candidate as a result of primary or caucus results, or state party directions. Here are the facts about delegates to the Republican National Convention and efforts to bind their vote according to primary results or instructions from their state party. In the following convention in 1880, rules committee chair James A. Garfield, who wound up winning the nomination himself on the 36th ballot and the White House that fall, wrote what is today Rule 37(b) of the temporary rules of the convention. This rule was enacted specifically to provide a mechanism that would ensure every delegate was unbound and free to vote their conscience, and it gave every delegate the right to challenge his delegation’s announced vote on the floor of the convention and have his vote recorded as he wished. 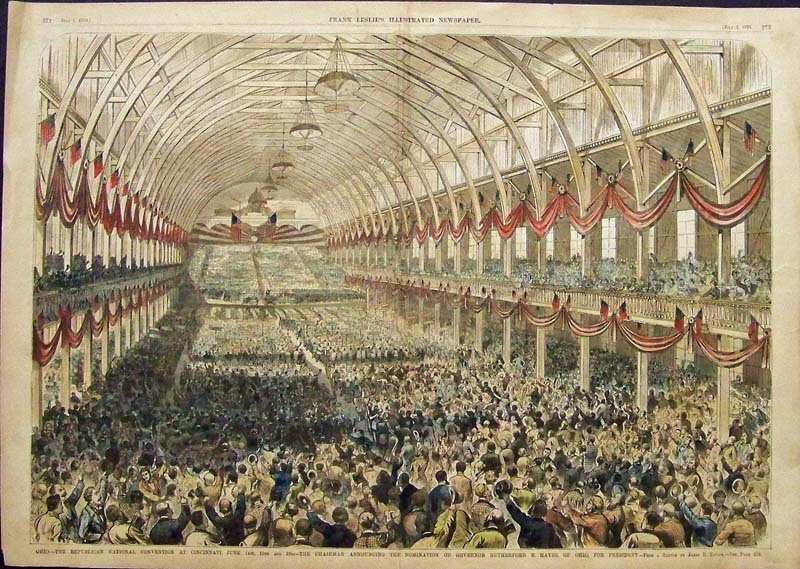 In rejecting the binding of delegates, both the 1876 and 1880 conventions were embracing what had been the understanding of previous conventions dating back to 1856, the first Republican National Convention. At both 1860 and 1868 conventions, some delegations arrived with instructions or recommendations from their state conventions on which candidate to vote for, and at both conventions the right of delegates to ignore those directions and vote their consciences was upheld. The Republican National Convention has also historically rejected the idea that state laws could bind delegates any more than state party rules or directions could. The very first time delegates were supposedly bound by state law was at the 1912 convention. Both the Illinois and Oregon delegations announced that state law dictated how they were to vote, but that some delegates did not want to vote as ordered. In the same way the Republican convention had always rejected any sort of binding, those delegates were allowed to vote according to their consciences and ignore state law. The Oregon delegation made similar announcements in 1916 and 1920, and each time delegates were allowed to ignore state law and vote their consciences. Although some claim it is “illegal” for delegates to defy state laws instructing them how to vote, the U.S. Supreme Court held in two cases nearly forty years ago that state laws could not trump national party rules. Part of their reasoning was that political parties must be free from government control, particularly in matters as important as who the party’s nominee would be, delegate selection, and how delegates could vote. And Rule 16(b)(1) stipulates that state party rules take precedence over state laws governing the election and selection of delegates, and that national party rules take precedence over both. So clearly the national party does not accept that state laws can supersede either state or national party rules. In short, the history of the Republican National Convention proves that delegates have always, with the exception of 1976, been free to vote their conscience, and the rule that has protected this right over the last 136 years remains part of the temporary rules of the 2016 convention. The U.S. Supreme Court’s rulings on the issue also make clear that delegates are free to ignore state laws purporting to bind them, and the one national party rule purporting to bind delegates expires at the start of the convention. These facts make clear that all delegates are completely unbound and free to vote their conscience on any and all matters that come before them, including the first ballot to decide the party’s nominee for president. No rule change is needed to unbind delegates, so long as the party stands by its 160-year history (aside from the blemish of 1976) protecting this important right. The Washington Post reported that a federal judge in Richmond ruled on Monday that Virginia can’t require Republican National Convention delegates to back Donald Trump. The Republican Party’s rules explicitly state that they take precedent over state laws and state party rules. Judge Payne’s ruling has no impact on the rules of the GOP convention, which will be determined by the convention’s Rules Committee when it begins meeting Thursday. 2 Feedbacks on "Fact: GOP Delegates Are Not Bound"
Not voting for the candidate that won the state primary, at least on the first ballot, would be a sure way to defeat in November. I suspect the polls that show Kasich leading Hillary don’t include the backlash of Trump supporters that wouldn’t vote for a Republican, even to stop the rise of the seas! If the GOP splits, I’d rather dispense with the cross-over democrat, low-information Trump supporters.